Wheels of Time was started in 1991 by Bill Bartolomeo, turning his avocation into his vocation. It didn't happen on purpose, though. Bill had just sold his oil business and decided to build a small shop where he could work on his own vintage cars, trucks and hotrods. Semi-retired, Bill spent hours at the shop, located at the edge of Pine Plains, NY. People would stop by to chat with Bill and before he knew it, he was working on other peoples' classic cars, as well as his own. Little by little, he added staff and expertise until by 2011, he had a staff of 5 craftsmen skilled in coachwork, metal fabrication, upholstery and painting, and an office administrator. In Fall 2011 Bill sold the business to one of his customers - Joe Quattrocchi - and retired. Joe, too, has turned his avocation into his vocation. In addition to owning Wheels of Time, Joe owns Action Canvas, a full service upholstery and canvas shop with locations in Pine Plains and Poughkeepsie and 3 satellite locations in marinas - Shady Harbor (New Baltimore), Rondout Yacth Basin (Connelly) and West Shore Marina (Marlboro). 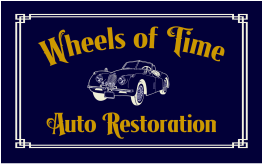 Over the years, Wheels of Time has restored, preserved or repaired hundreds of classic cars, including Jaguars, Ferraris, Austin Healeys, Willey's and Model As. Our skilled, enthusiastic and motivated technicians apply a wide range of skills and expertise to restore, repair and service an array of collectable vehicles. Thank you for visiting our web site. Please take time to explore the site and learn about all the services we offer, projects we have completed or are currently working on and the people who could be restoring your classic car.